Order Flomax and other prostate medications through one of the largest online pharmacies in Canada. CanadaPharmacyOnline.com currently stocks the brand name Flomax CR tablets (controlled release) from Canada, Flomax MR capsules (modified release) from UK manufactured by Boehringer Ingelheim. 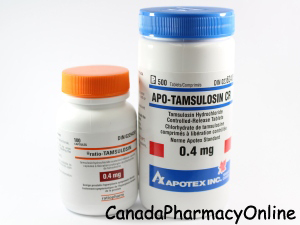 The generic Tamsulosin capsules come from Canada made by Ratio Pharma and Tamsulosin tablets come from Canada made by Apotex Inc. It also comes from different manufacturers around the world. Other generic names include: Urimax (by Cipla in India), Diffundox XL (by Zentiva in the UK), Flomaxtra XL (by Astellas Pharma in the UK), Contiflo XL, Stronazon MR, Tamurex (by Somex Pharma in the UK), etc. Please call customer service at 1866-920-3784 or visit us online at CanadaPharmacyOnline.com. Flomax (Tamsulosin) is used to improve urination in men with enlarged prostate. Flomax belongs to a group of drugs called alpha-adrenergic blockers. This medication works by relaxing the muscles in the prostate and bladder neck, which makes it easier to urinate. Relaxing these muscles helps to relieve symptoms of BPH such as difficulty in the beginning the flow of urine, weak stream, and the need to urinate frequently or urgently and during the middle of the night. This medication should not be used to treat high blood pressure. You should not use Flomax if you are allergic to Tamsulosin. Before you start taking the medication, talk to your doctor about your medical conditions and about all the medications you are currently taking including OTC and herbal medications. This medication may make you drowsy, be careful if you drive or do anything that requires you to be alert. You should not stand for long periods of time or get overheated during exercise and in hot weather. Avoid getting up too fast from a sitting or lying position or you may feel dizzy. Flomax can affect your pupils during cataract surgery. Inform your eye surgeon ahead of time that you are using this medication. This medication is not for use in women and children. There may be an interaction between clarithromycin, cimetidine, doxazosin, prazosin, quinidine, terazosin, etc. 1. Does Flomax capsules affect my blood pressure? Answer: Yes, Flomax may cause a sudden drop in blood pressure upon standing, especially after the first dose or when changing doses. You should change positions slowly from lying down to sitting up or from sitting to a standing position until you learn how you react to this medication. 2. Can I drink alcohol while I am taking Flomax? Answer: Drinking alcohol can increase certain side effects of Tamsulosin. Tamsulosin may impair your thinking or reactions.